Energy does not come cheap, and with rates always on the rise, more and more homeowners are looking for as many ways as possible to pay less for heating and powering their home. If the idea of saving energy makes you imagine huddling up on the sofa wrapped in all your blankets with the heating system off, you’ll be glad to know that there are a number of different things which you can do to reduce the amount of energy you use, without the need to freeze. We’ve listed just a few for you here. More and more people are turning to self-sustaining living, and generating their own energy via solar panels on the roof of their home. 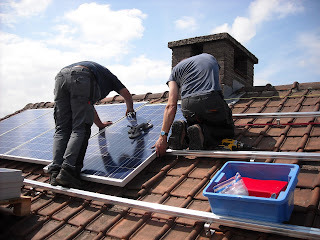 Solar panels can be used to power your whole home – which is great if you live in a really sunny area, or you can use them along with conventional electricity to slash your electricity bills. Depending on the area where you live, you may be able to have solar panels installed at a reduced price or even for free as part of schemes to help homeowners become more eco-friendly. Looking for air leaks around the home is just one simple thing which you can do to help reduce your energy bills each month. Weather stripping and caulking around windows and doors can start to become worn and torn, and leaks allow the hot air to escape from the house and let drafts in – making your heating system work harder to keep the property at a comfortable temperature. Sealing up these leaks will help to keep more hot air trapped inside and keep the drafts at bay so that your home stays at the temperature you need without the added price. Carrying out a full energy audit of your home allows you to find any areas where energy is being wasted, and rectify them so that as a result, you’re only using the necessary amount of energy needed to heat, cool and power your home. Audits involve doing things such as checking insulation and finding air leaks, and you can either do them yourself or hire a trained professional to help. Many energy providers will send somebody to audit your home for free at your request. With the large majority of energy providers not requiring their customers to be tied into a lengthy contract, it makes sense to keep your eye on all of the different providers to see who’s offering the best rates, and switch accordingly. Staying loyal to an energy supplier who is charging more than their competitors are means that you’ll end up throwing money away, so be savvy and regularly check different supplier websites or energy rate comparison sites such as http://energycompaniesalberta.com/ in order to make sure you’re not paying more than you need to. Switching is usually quick with little to no inconvenience. How do you keep your energy bills low? We’d love to hear your top tips in the comments.